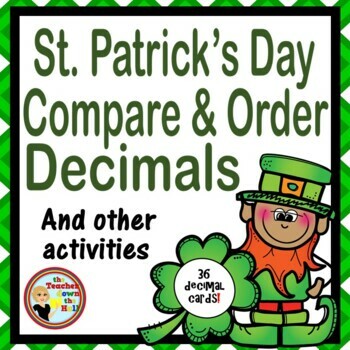 St. Patrick's Day Compare and Order Decimals and other activities! 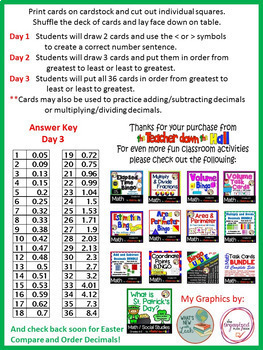 This set includes 36 decimal cards to the tenths and hundredths place. 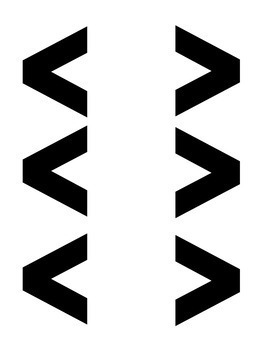 Students will draw 2 cards and complete a math sentence using the < or > symbol. Next, they can draw 3 cards and order them from least to greatest or greatest to least. Finally, students can take all 36 cards and put them in order from least to greatest or greatest to least (an answer key is included for this activity). 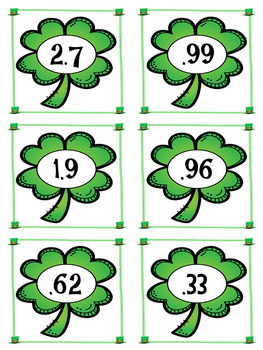 Cards may also be used to set up addition and subtraction of decimals as well as multiplication and division. Lots of practice with decimals! • Look for the green star at the top and to the right on this page and click it to become a follower. The star is next to my store name: Joyful Projections. When I add a new product, you will receive an e-mail with a link to its description. If you choose not to receive e-mails, simply go to My TpT and click on My Favorite Sellers. This is a list of the sellers you are following. You can turn off notification (from green to red). • Please go to My TpT and click on My Purchases (you may need to login). Beside each purchase you'll see a Provide Feedback button. Simply click it and you will be taken to a page where you can rate and comment on the product. • Pin it! Start a board on Pinterest and pin this product by clicking the Pin It button on the top left of your screen.